If I had to rank the things I find most annoying in this world, it would go like this: Los Angeles traffic, learning a longtime favorite beauty product has been discontinued, and acne scars. The first two are particularly dreadful since they're so far out of my control, though the last one feels so much more inescapable (after all, acne scars are there to remind me of their presence every time I glance in a mirror). While there are a couple of things you can do to prevent acne scars from forming—like washing our faces daily, controlling oil and pore buildup, and not picking at blemishes once they appear—sometimes they appear for what seems like no reason. Once that happens, they're extremely difficult to do away with. The most effective tool for diminishing and even vanishing acne scars from the skin's surface has to be a chemical peel. They're gentle on the skin but tough on scars. Keep reading to learn everything you need to know about using chemical peels to treat acne scars. Before getting into the science behind chemical peels, it's important to note that there are two types of skin exfoliation: chemical and physical. The former, according to NYC plastic surgeon Melissa Doft, MD, is "an acid solution," that does away with dead skin and pore-clogging impurities on contact. The latter involves massaging something that has a slightly abrasive texture over the skin in order to manually remove debris (classic exfoliating scrubs like St. Ives Apricot Scrub, $4, are physical exfoliants). Chemical peels are a strong form of chemical exfoliation. Doft says that they "cause a controlled injury to surface skin cells." It sounds a lot scarier than it is, but remember these injuries are on a cellular level (kind of like micro-needling). "The strength of the peeling solution will determine the level of injury to your skin," Doft says. "After the skin is injured, it will peel off and new cells will replace the old ones. Stronger peels will cause a deeper injury and thus require more downtime to heal." Since brand new cells replace the old, expect the skin to look more even, glowy, and fresh. "A chemical peel exfoliates the skin on a deeper level than topical exfoliation. It rejuvenates and produces new skin," she says. "Both at-home and in-clinic chemical peels are effective at reducing the appearance of acne scars." Doft also lauds the powers of a chemical peel for reducing acne scars and acne in the first place. "Both at-home and in-clinic chemical peels can be helpful in treating acne," she says. "The peels that are used in a doctor's office are stronger than those available at home. When applied, they remove the top layer of skin, unclogging pores and improving skin texture by increasing skin turnover. They are also helpful in removing hyperpigmentation and darkening caused by acne flares." In her office, she uses the VI peel for acne-prone and aging skin. "It is a medium strength peel that is excellent for hyperpigmentation and superficial acne scars." As for how soon you can expect to see results, it depends on a couple of different factors, namely, type of peel, how often you use it, and your specific skin type. "Generally, I recommended to have a peel every four to six weeks for best results," Darden says. Don't panic if you experience slight irritation or even some actual peeling. "All peels are different as they contain varying acid combinations, which penetrate the skin at a unique level," Doft says. "Superficial peels may leave you slightly dry that evening. Medium-strength peels will cause your skin to peel and blister two to three days after the peel is applied. During this time, your skin may feel dry and tight. It is necessary to keep your face moist using products like Aquaphor Healing Ointment ($5)." It's after you pass these stages that the real results appear. Then, pile on the sunscreen, as Doft says the new skin cells will be more susceptible to sunburn. Darden agrees. "Before a chemical peel, I advise [my clients] to stay away from exfoliating products, Retinols, or Tretinoins. I also tell people to avoid the sun and always have on sunscreen! You want to use the same precautions after a chemical peel as well since skin can be sensitive at this time." However, Darden notes that if you're in between chemical peels and you aren't gearing up for one or healing from one, retinol is a good idea for reducing acne scarring. 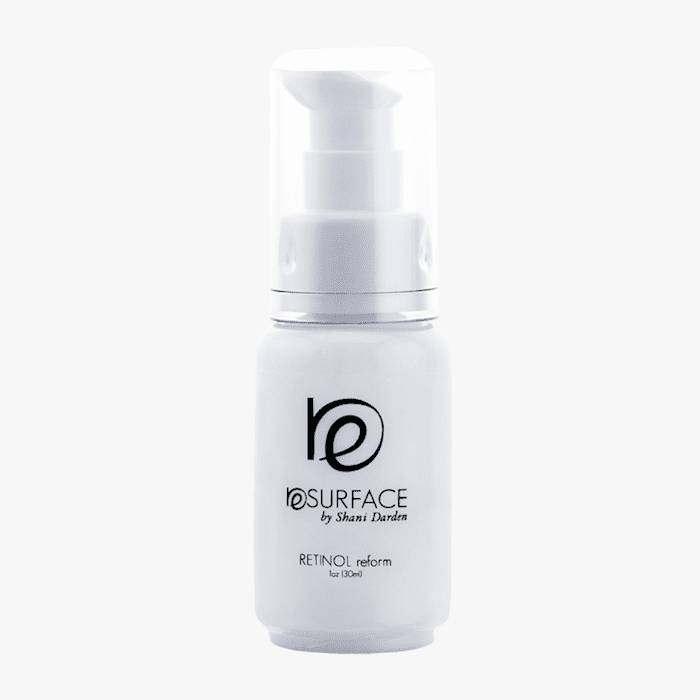 "For reducing the appearance of acne scars and the chance of new scars from forming, I recommend using Resurface Retinol Reform. It stimulates cell regeneration, which reduces the signs of aging, scarring and acne." This retinol is a Byrdie editor favorite for its effective yet gentle formula (many a editor swears it's brightened and evened their complexion). "I also love IS Clinical's Super Serum Advance Plus ($148) because of its powerful healing capabilities, since it includes ingredients that promote wound healing and the reduction of scar tissue like stabilized L ascorbic acid (vitamin C), the bioidentical Copper Tripeptide Growth Factor, and the super antioxidant centella asiatica," Darden says. Or, try IS Clinical's Active Serum ($135), another fan favorite, which prevents scarring and lightens existing scars. Next, see 11 beauty gifts priced under $25 that look way more expensive than they are.